One of my goals with this year’s spring chick order was to add some color to my egg basket. Up until now, I’ve only had brown and cream egg layers. So the first bird on my wish list to help me accomplish this was My Pet Chicken’s exclusive Favaucana, with sage green eggs. Why Favaucanas? Because besides the plentiful sage green eggs that I was anticipating, the Favaucana chicken was everything I look for in a breed: they’re hardy, friendly, and docile. Also gorgeous! 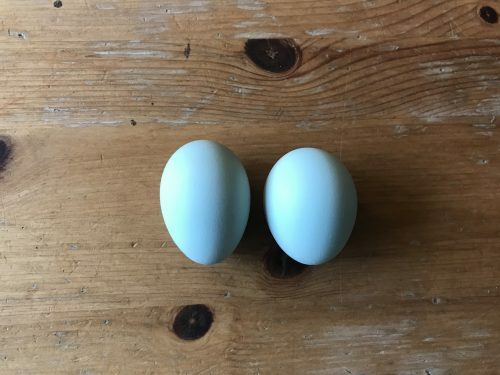 I didn’t need to wait long for my Favaucana girls to produce eggs, either. 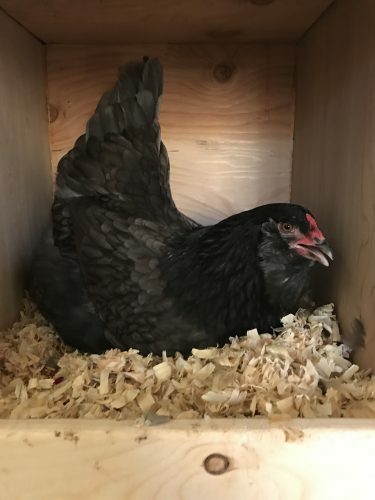 My black Favaucana Maisy laid her first beautiful sage green egg at 26 weeks old. She has proven to be a very productive layer of medium sized green eggs. She lays 5, usually 6 eggs per week! Maisy laying one of her beautiful green eggs. Favaucanas are one of My Pet Chicken’s designer breeds and they are wonderful. You won’t find these at another hatchery—not yet! But heck when Lissa first wrote about her Favaucanas for MPC in 2012, we didn’t have them either. But she sent eggs to MPC’s owner, Traci… and Traci fell in love, too. Now we hatch them so you (and I) can have them, as well. They’re among the varieties Traci delivered to Martha Stewart this year, too! Fair warning: chickens are addicting. You may find yourself using Chicken Math to get some Favaucanas. You may even become a chickaholic. Besides the beautiful green eggs that Maisy lays, I find her to be a very curious and chatty bird. She is always one of the first to greet me and inform me of all the goings-on in the flock. She is a unique looking bird, too, with 5 toes and lightly feathered legs. I can usually find her hanging out with her best pal, Daisy, a black Ameraucana. Maisy does well being confined in the run with her other flockmates, but also enjoys her free range time in the afternoon. One of her favorite hobbies is breaking into my garden and snacking on the kale plants and foraging for bugs. Favaucanas are a mix between Salmon Faverolles and Ameraucanas. The sweet personalities of both these breeds shine through in the Favaucana. So far, Maisy, who has a pea comb, has proven to be winter hardy here in the Northeast handling the cold temperatures well while continuing to still lay. She gets that from the Faverolles side; Ameraucanas are cold hardy, but not especially known for winter laying. 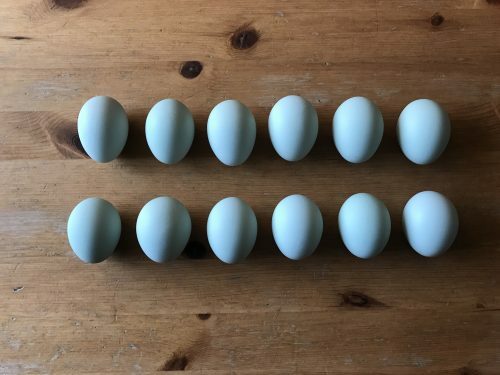 The first dozen Favaucana eggs laid. Favacaunas would be a great addition to the flock. They’ve been dependable layers of medium green eggs—the eggs will get larger as the hen enters her second year. Plus, they’re sweet, curious, and docile. What colors and breeds do you want to add for 2017? Forest!! It’s been a while since I’ve checked the MPC blog, so this morning I pulled it up and walla….there’s a post by written by Forest. 🙂 Those Favaucana’s sure sound like sweet birds! Currently, we do not sell this breed in Australia. Please feel free to visit our website to view any information about them. We hope to be able to share this breed in the future with you!